Let's face it. Most times, the wedding is usually rated on the party rather than the ceremony. 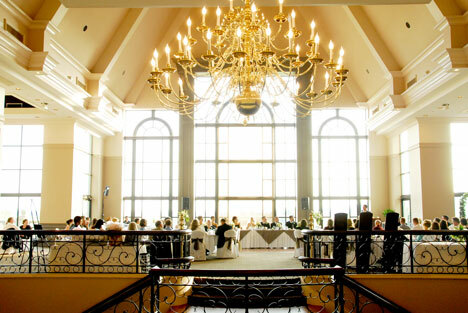 The first thing that brides and grooms select when planning their wedding is where the reception will take place. If view and outside settings are important in your overall plan, make sure you pick a venue that allows for you and your wedding guests to appreciate the setting. Are there enough windows in the venue for all to admire a water or mountain view? Is the outside easily accessible for those wishing to stroll in the landscaped gardens? Does the venue have restrictions to guests smoking or taking their drinks outside? Will it comfortably accommodate the maximum number of guests you are expecting? (Keep in mind the number of tables you will require versus how much of a dance floor remains etc.). Is the venue child friendly e.g. highchairs? How easy is the commute between the wedding ceremony and the reception? How long will it take for guests to arrive? What about the drive back after the reception? Is there ample parking for all attending? If not, does the venue offer valet service? Who will pay? Does the venue provide its own catering? If so, do they restrict outside vendors to work in their facilities? Does the venue have a bar facility? Can you bring your own beverages in to cut down on costs? Do they provide licensed servers or do you have to hire your own? Check out the restroom facilities to verify their overall condition. If they are not usually stocked with various essentials, make sure you have someone taking care of that in advance. Does the venue offer enough assistance to you and your fiancé while making your wedding plans? Are they easily available to meet or to discuss issues and concerns with you? What time will the venue open for outside vendors to come in for décor, food prep, beverage drop off etc.? Does the venue allow enough time for your party to be set up/disassembled? What time can guests start coming in? What time must the party end? Are there provisions for elderly or physically challenged guests e.g. restrooms? Are there elevators to assist those who cannot climb stairs? Find the perfect wedding reception location, in your region, in our Directory.